Have your wedding on Navarre Beach and your entire wedding party can stay in one of Navarre Properties' beautiful beachfront rentals. Our white sandy beaches and amazing sunsets make Navarre Beach the perfect wedding setting. Navarre Properties wants to make sure your wedding is as special as the love you share. Navarre Beach, Florida is the perfect location to have your Gulf Coast wedding and we have the perfect beach house to host your dream big day - our 5 bedroom house, Cabana del Sol. Navarre Properties has worked alongside with Tropical Beach Weddings and White Sand Weddings, local wedding planners who have the knowledge and skill to make sure your ceremony is as perfect as the powder white sand and emerald waters of Navarre Beach, Florida. Once your big day has come to a close, it's time to enjoy some one on one time. Let Navarre Properties find the newlyweds an ideal unit to spend your honeymoon. We have many vacation rentals to fit anyone's wants, needs, tastes, and budget. 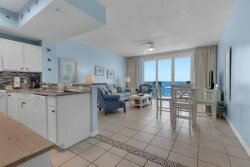 From cozy studio units to spacious beachfront penthouses, let Navarre Properties help you make that day so much better! Contact our office today for additional information about planning your dream Navarre Beach wedding. We look forward to being a part of your special day!